I am quite confused why my Motorola E 2nd gen sprint LTE phone is unable to detect this SIM card. I had this phone with RingPlus initially and then later with Ting and then finally stop using their service and wanted to migrate to FreedomPop but it seems like the phone refuses to detect the SIM card. I tried putting the SIM card into my ATT iPhone 5S and it was detected (couldn't be used of course but at least I can see that the phone was able to detect the ICC number from the SIM). 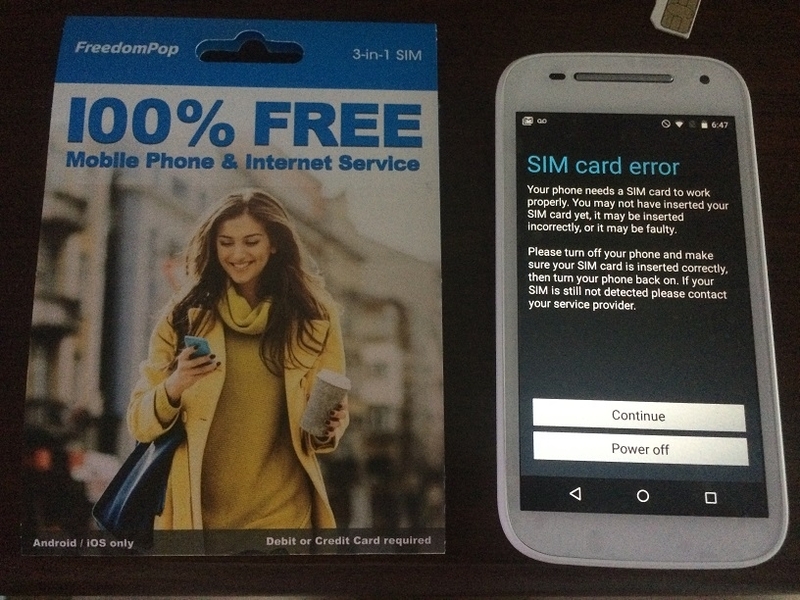 Other Sim cards appear to work fine such as my GSM World FreedomPop SIM card (which doesn't work with my Motorola phone since CDMA and not compatible with GSM I think). Forgot to mention that I also made sure my freedom SIM was activated. I checked it through the FreedomPop activation webpage though it was unnecessary since I did buy this from FreedomPop directly. I received the same phone today, and i'm having the same error! Except that occasionally, it does work for a little bit, and i see "Sprint" instead of "No Sim Card" in the top pulldown menu. But then it goes back to "No Sim Card" without me doing anything. 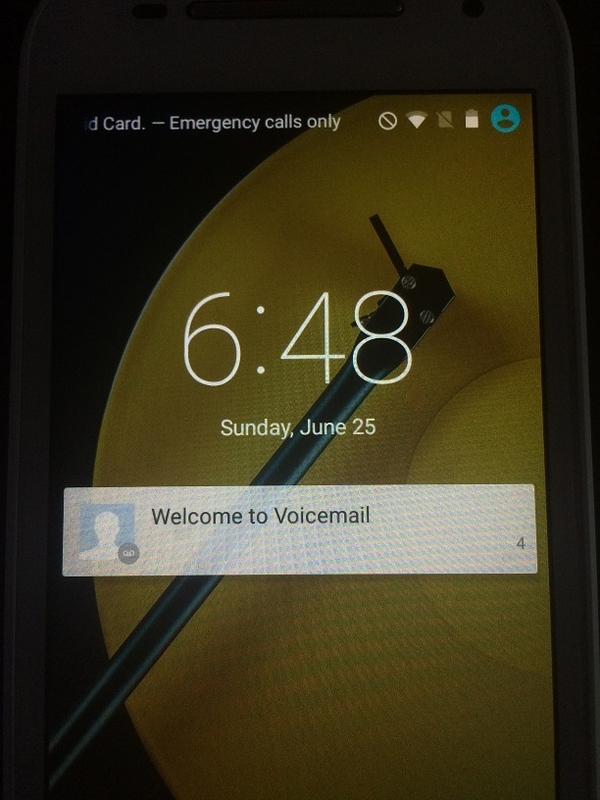 @Vinh N & @Ann Stohlmeyer - both the FP LTE SIM & Global SIM are GSM based & whilst the Moto E 2nd gen can apparently use GSM based SIMs, it may need to be configured to do so - I don't own this phone, so I'm not sure how it responds to a GSM SIM when not yet set up to use the GSM side. The phone might also need to be unlocked for international use (if not already), which would allow use of international GSM based SIMs, such as the FP Global SIM (which is seen as having a UK operator code) - however, the FP 4g LTE SIM is a domestic USA SIM, so won't work without a domestic unlock (which Sprint won't do, as I understand things). You both may be able to use the Sprint LTE/CDMA side of the phone on FP via the BYOD service, rather than using the FP LTE SIM. Thanks for the answer limey. I always thought the FP LTE SIM was for CDMA to be used on phones with Sprint service but interesting... didn't know it was actually meant for GSM phones. If that is the case, then I guess I can plop one of these into my GSM phones for use instead of the Global SIM while in the states. @Vinh N Yes, the LTE SIM should work in the GSM phones that you currently use the Global SIM with (unless they're using Edge, in which case you may run into issues, due to AT&T moving away from Edge support). Outside my area of experience, but was the phone previously de-activated from Ting? I just tried the BYOD option again with FreedomPop and it seems to work now! Maybe it was just some temporary server issue earlier but anyway glad to know that my phone can be brought over to FreedomPop though a bit steep for the up front activation fee. Thanks for your help guys. Yes! It was on the Ting service before and then I cancelled the service with them. I'm guessing that's a good indicator that the phone most likely won't work with FreedomPop huh? @Vinh N - not sure about this, but it might be worth contacting Ting to see if they still need to release the phone in some way. Hey Limey, thanks for your help earlier. I just tried it again and it appears that the FreedomPop BYOD was just erroring out due to some temporary issue. It appears to finally work so that's good. Thanks again!